Workplace safety should be the number one concern of employees and employers. Without safe working conditions, it’s only a matter of time before production halts, workers are hospitalized, and many other adverse events can damage lives and the company’s reputation. Without workplace safety, things simply fall apart in general. Most company policies have mission statements. The order is as follows: safety, quality, and then quantity. Many companies or their employees tend to lose sight of the mission and behave as if the items in the above statement come in the opposite order. It’s the task of the employees and the supervisor to remember the correct order of the goals in the mission statement and get all jobs done efficiently and safely. 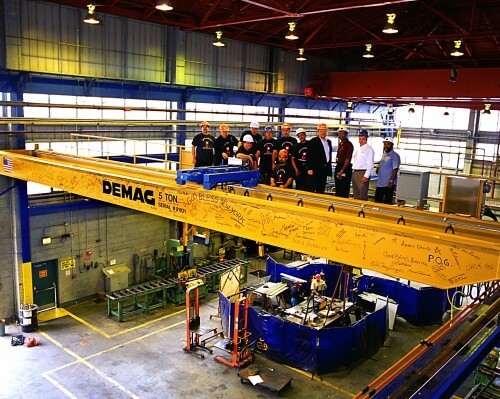 Whether working on overhead cranes or hoists, the safety mission remains the same. In this instance, danger can arise immediately and change things forever, for both employee and the firm. There are four main reasons why workplace safety is essential and not just a casual option. This is the number-one reason why safety is important. Good employees are not easy to find and if they regularly get hurt, then the work is not going to get done. This should be a no-brainer. Workplace safety should be instilled in the mind of every employee of the company; it should be just as natural as putting one foot in front of the other. That’s how important safety really is. In the factory environment, utilize safety engineering. Make sure to inspect all hoist equipment. Such inspections should be done on a daily basis, according to OSHA regulations. Not only do accidents harm the employees, they also damage the health of the company. When accidents happen, worker’s compensation comes into play. Every dollar spent on lost time and medical expenses is that much more of a loss for the company, ultimately limiting raises or worker’s incentives. Many employees do not realize how much money is spent on accidents in the workplace. Staying safe saves money and allows the company to accrue more profits, both for the establishment and for the worker. Always pay attention to your surroundings. Not only is it your job to be safe, but it’s also your responsibility to ensure your surroundings are just as safe as you are. The safest employees will more than likely be the ones who advance within the company. Let’s face it: no employer wants to reward someone who is accident-prone or unwilling to pay attention to safety regulations. In order to get raises, promotions, and other amenities, you must learn and utilize all safety tips and regulations. This is a big step in advancement and job security. For full protection when working on overhead cranes and hoists, make sure to wear the correct harnesses and head protection, and use scaffolding when possible. These basic safety items are a must. If you’re an employee who pays attention to safety regulations, you set a positive example for others. Not only are new employees watching your every move; they are also using you as an example of how to perform. If you correctly observe all safety precautions, then coworkers will emulate your actions. If you do not work safely, then you set the example of someone who does not care for or respect the job. Keep your mission statement close at hand. You may want to remind others of the importance of safety. The workplace must be kept safe; for the company and for you. When working on an overhead hoist, the dangers are many. To remain safe, stay familiar with each and every safety aspect of your job. Safety in the workplace is number one!